On the 2nd leg of our Hong Kong trip, we went to Macau for a night. We stayed at the Sheraton Macao at Cotai Central, which is part of the Cotai strip. 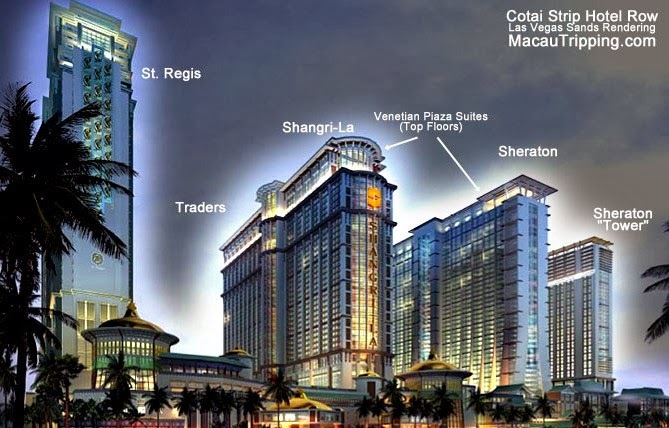 According to Wikipedia, the term Cotai Strip is a trademark granted to Las Vegas Sands Corporation. The group 'envisioned that their development of several adjacent properties would comprise an area that would resemble the Las Vegas Strip.' So I believe, Sands own a majority of the land around this area. to the number of guests coming in. Behind the screen on the background is the Casino. On the left of the hallway is the bathroom. Very bright. I am glad they include a separate shower area and bathtub. The shower comes in a funny matte gold colour. Large area on the counter-top. With a questionable Eames Executive chair. Wifi is not complimentary though. At that time, the Sheraton Macao was newly opened with 4000 rooms. It is part of the Starwood Preferred Group (SPG) which also includes Meridien and the Westin. When we were there, there was a parade conducted by Dreamworks characters like Madagascar, Shrek and Puss in Boots. I think Macao is slowly trying to incorporate family entertainment other than relying on gambling as its core business.